Tucked away in a cozy setting Kirkwood is a ski lovers paradise! Because of a favorable geographic position (Western side of the Sierra Crest/Carson Pass) Kirkwood consistently gets at least a 30-40% better snowfall than other resorts in the South Lake Tahoe area. 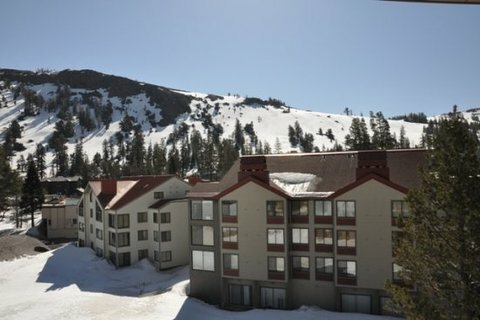 Kirkwood is remote, located about 35 miles south of Lake Tahoe adds to the appeal of the resort as it draws fewer Northern California skiers than the ski resorts located around the Lake. Skiing Kirkwood is like skiing a 2,000 acre bowl. The area offers 15 chairlifts servicing 87 trails. The longest run at Kirkwood is 2.5 miles. Kirkwood has a fair amount of green (12%) and blue terrain (20%) for the whole family. For those a bit more adventurous some of the best advanced terrain (38% advanced and 30% expert) can be found, much of which has been featured in many ski and snowboard movies. The beginner and intermediate terrain is generally located on the lower portion of the resort. In addition to the "bowl" skiing, Kirkwood has a back side which mostly shout skiing. Kirkwood receives an average of about 600 inches of snowfall a year. In the peak of winter it is common for the snow on the side of the road to be twice as high as your car. We locals call this our K-Factor. When compared to all other Tahoe resorts (excluding Mt. Rose which might be comparable) the snow is the lightest and driest. Lodging consists of mostly condominiums that are walking distance or less than a 3 minute shuttle ride to the base. Hotel opportunities are offered at the Meadowstone. Accommodations are privately owned and as such are individually configured and decorated. Housekeeping services for fewer than five nights is available for a fee. Five or greater nights offer one mid-week cleaning.